The Uncanny Magazine Podcast Won the Parsec Award! 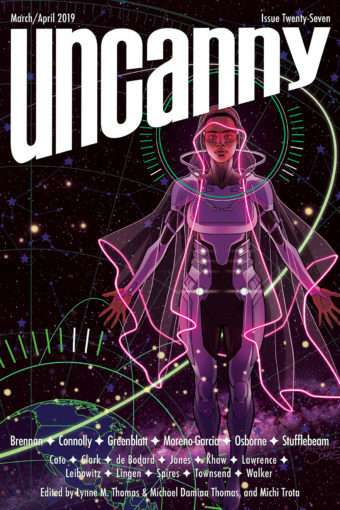 Uncanny Magazine Issue 12 Cover and Table of Contents! The Uncanny Kickstarter Reached EVERY STRETCH GOAL! Tran Nguyen Wins a Chesley Award! More great Uncanny Magazine award news from MidAmeriCon 2! Tran Nguyen’s Uncanny Magazine Issue 4 cover, Traveling to a Distant Day, won the Chesley Award for Best Cover Illustration – Magazine! This is in addition to it already winning the Spectrum 23 Award- Editorial Category! Congratulations, Tran! Uncanny Magazine, Pockets, and Heat of Us Are All World Fantasy Award Finalists! Uncanny Magazine Issue 11 Cover and Table of Contents!